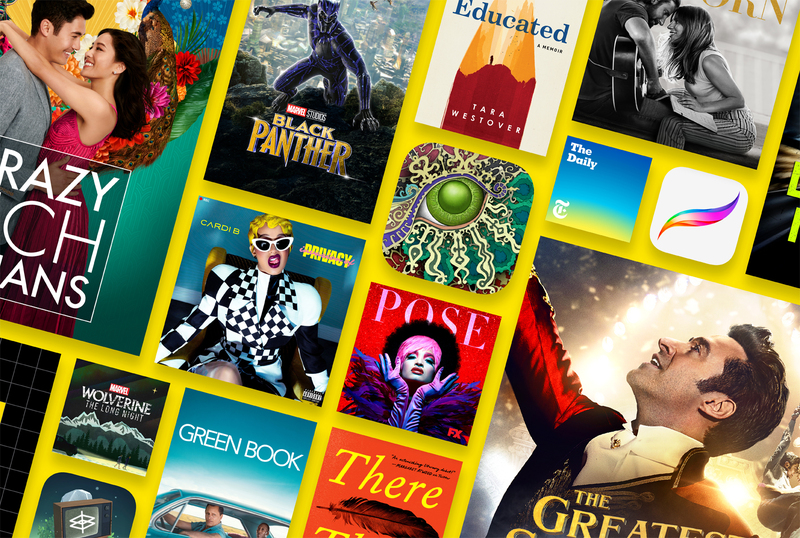 Apple presents the best of 2018<br/>The Apps, Games, Music, Movies, TV Shows, Podcasts and More That Shaped Entertainment and Culture Around the World This Year<br/>As the year comes to a close there are so many unanswered questions: Who is Kiki, and does she love me? Should I start a podcast? Where is Donut County? Why didn’t Offred escape Gilead (again!)? Today, Apple reveals the Best of 2018, a global collection of top charts and selects from our editors across every category highlighting all of the amazing things to watch, read, listen to and play across apps, music, podcasts, books, TV and movies. It’s an invariable list of the who’s who and what’s what from the past year that is certain to help answer at least some of the most burning questions and make for fun conversation around any holiday dinner table. <br/>This year, <a href="https://itunes.apple.com/story/id1440852242?itsct=BESTOF_SC18_PT122_US_SI1440852242&amp;itscg=as10001" target="_blank">Battle Royale-style games</a> like Fortnite and PUBG Mobile dominated global gaming culture with exciting, last-player-standing action, while innovative apps like Fabulous, Shine, 10% Happier and Headspace expanded the practice of wellness around the world to make <a href="https://itunes.apple.com/story/id1438571562?itsct=BESTOF_SC18_PT122_US_SI1438571562&amp;itscg=as10001" target="_blank">self-care more accessible</a> than ever before. <br/>iPhone users running iOS 11 and later will view iPhone charts below; iPad users running iOS 11 and later will view iPad charts. <br/>To close out an extraordinary year, Apple Music’s editors have awarded highest honors to the <a href="https://itunes.apple.com/WebObjects/MZStore.woa/wa/viewMultiRoom?cc=us&amp;fcId=1441981146&amp;ls=1&amp;app=music&amp;at=1001ltS&amp;ct=rom_bestof2018&amp;itscg=30300&amp;itsct=rom_bestof2018" target="_blank">artists who truly represent the very best of 2018</a>. Drake owns the Artist of the Year category while country’s Kasey Musgraves scores Album of the Year for her dynamic <em>Golden Hour</em>. The fiery collaboration between Cardi B, J. Balvin and Bad Bunny made “I Like It” an easy choice for Song of the Year and Breakout Artist Juice WRLD has been giving everyone “Lucid Dreams” all year long. But these all-stars weren’t the only stars: Apple Music’s global year-end charts and editorial playlists are packed with the year’s biggest hits and favorites from all over the world. <br/>The <a href="https://itunes.apple.com/US/app/tv/id1174078549?mt=8&amp;app=tv&amp;cvs=edt.cvs.5be1f95e-9a98-4b11-a857-2cbe965ba4d6" target="_blank">movies and TV shows</a> of the year represent a rich mix of genres and topics ranging from indie, documentaries and animation to drama, horror and action. “Black Panther” and “Killing Eve” are the top picks of the year; they, along with other notable titles such as “Won’t You Be My Neighbor,” “Hereditary” and “Pose,” have been praised by critics and fans alike and fueled pop culture conversations and die-hard fandom around the world.